Yank Azman's Genuine Vintage: The Hundred Dollar Hamburger. We're going to have to rethink this whole Odessa thing. 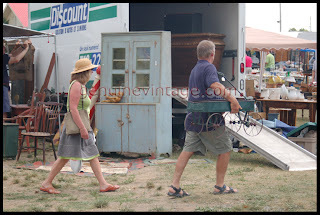 The Odessa Antique Show opens for early admission at 2:00pm Saturday. That means we pay $20.00 each, rather than seven bucks a day later, so we can get in there and scoop all the good stuff. With gas and food and admission for two people we're looking at about $100 in the hole before we've spent penny one on antiques. The show itself was okay but nothing outstanding, nothing worth driving and $100 for, other than a day in the country. That hundred bucks would have made the difference in a number of ebay purchases, so again I'm thinkin' why bother? Then there's the attitude. 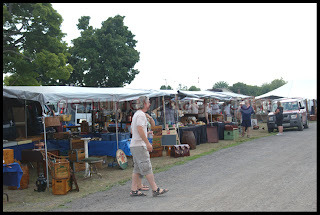 Since many dealers were running around trying to shop at the other dealers, they didn't get their own set-ups open for the early admission shoppers. If you asked them when they were going to be open, the response was mañana, they'll be ready for Sunday's opening. So why am I paying early admission? A little background here. When we first started doing this about thirty years ago, there was no real early admission. A few collectors caught on to the notion that they could rent a space at a show, not bother putting anything in it, and then spend the whole time shopping before the general admission gates opened. Four people in one car could split the cost. It might even work out to be cheaper than general admission. The show managers twigged to this and started selling early admission tickets for about the same price as a booth rental. This appealed to both collectors who were willing to pay the premium to get first pick, and to promoters willing to take in the extra money without booking potential no-shows: a lot of empty dealer spaces on the field look bad for everybody. Dealers gained by having motivated shoppers in right off the top, but lost the early picking edge for themselves. It's always been a delicate balance this buying/selling thing: most dealers start as collectors. Nobody at age six said: I wanna be a dealer when I grow up. Okay, maybe the Keno Brothers did. But somewhere along the line the little cartoon light bulb went off over her head and the collector said: hey, I've got two of these apple peelers, I'll sell the yucky one at twice what I paid for it and that'll pay for the good one I'm keeping. Thus is born the dealer. But where do you serve your customers in all this? Are you keeping the best stuff for yourself? Are you doing all this running around for them or for you? Again, I'm thinkin' why pay early admission if a third of the dealers aren't there to sell? As for the stuff that was there, not great. Many dealers though seem to be living in the mid 1990s when pricing was top dollar. Let's just say that the pricing on the field was, at best, optimistic. Maybe they are getting that kind of money for the merch, I don't know, but a couple of American shoppers visitors were overheard on a cell phone telling friends not to bother coming: too high prices, too low value. I know I didn't buy anything except a hamburger, and not a particularly good burger at that. But the sun was out and it was a lovely day in the country.